I’m already adding this to my meals this week. It looks so good! These colors in the photos are perfect. This looks so good! Corn on the cob right now is the best!! Have to use some of it to make this. You’re reading my mind! It has been ABNORMALLY chilly here this month (I’m talking 60* mornings, and highs of 76*) And while i am 1000% bummed summer was cut short, It has me amped for autumn! All I wanted to meal prep this week was some delicious chowder, with yummy summer corn, and THICK CUT LOCAL bacon! The wife wasn’t on board -she is in denial even though she is leaving for work every day in a sweatshirt. You’re my dream girl today, I want this so bad. I’m so ready for fall and I don’t care who knows it. Bring on the soup! This looks like the best corn chowder I’ve ever seen. Grilled corn? You are a genius. Thank you for answering my question, “Just what the heck do I do with all these chicken thighs I bought on clearance and are expiring soon? ?” This is the PERFECT answer! haha you are so welcome! enjoy carrie! This sounds amazing! It is everything I could want in a bowl. We always have extra corn on the cob because I buy a ridiculous amount. Glad to have a way to use it up! mmm looks so good! I will def have to try this. 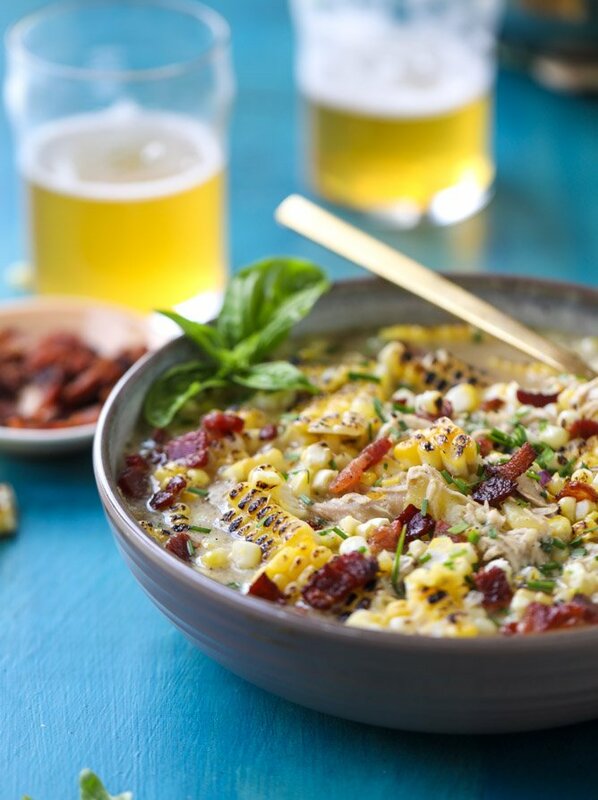 the grilled corn MAKES this soup! I would love to make this if you could suggest a good alternative for the beer. Can I leave it out or do I need to sub in something? you can totally leave it out! :) just use that amount in chicken stock instead and add it with the rest of the stock! Thank you for the wonderful recipe! It is very damp and dreary in New Orleans and this is the perfect summer soup for hunkering down. Oh my goodness! I am putting this on my menu for next week!! I get it, this does look hearty enough to be dinner soup! A very nice recipe, or chowder, guess you could even add clams! Anyway, I love it how it is, so thank you! I made this for dinner tonight and the family loved it! Would be good with some green chilies in it too for a little kick. The beer adds a nice savory complexity to balance out the sweetness of the corn. Thanks for the great recipe! I am definitely gonna try this, I will spice it up some but it looks like it would be perfect as is. I just have a thing for spicy, and since it’s winter in North Dakota bring on the heat!! Would a darker or lighter beer work best? I have made this recipe so many times since finding it in the summer – I’m not a soup fan and I love this soup. Thank you for this recipe. It’s the greatest soup ever !! Looks so good. I think I may add the flour after the onions are done to cook it a bit. Yum! Loved it! Thank you for sharing this. I saved the 🌽 just like you said thinking of cold winter days and this recipe came in perfect in what to do with it.